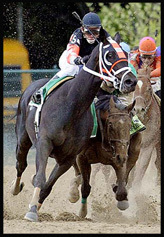 Afleet Alex (TrueNicks,SRO): Conformation, left, and nearly falling before winning the 2005 Preakness Stakes (gr. I,Video). With a view to the future, it’s possible that the most significant race of the weekend in the U.S. was the Pegasus Stakes (gr. III) at Monmouth. With plenty to play for as far as leadership of the 3-year-old male division is concerned, this is the time to look for potential "second season" stars, and with a decisive 1¾ lengths win here, Afleet Express placed himself firmly among their number, with the Haskell Invitational (gr. I) being an obvious target. The race was also notable for colts from the first crop sired by Afleet Alex (TrueNicks,SRO) taking first and second here, with Withers Stakes (gr. III) winner Afleet Again taking second. Adding in last year’s Hopeful Stakes (gr. I) victor Dublin – also grade I-placed this year – Afleet Alex now has three U.S. graded winners among his seven first crop stakes winners. To make the weekend even brighter, Afleet Alex’s second crop was represented by sharp-looking Belmont Park maiden winner Commonwealth Rush (dam by Forest Wildcat) on Friday, and Avatar Day (out of a Salt Lake (TrueNicks,SRO) mare) was second in the Premio Primi Passi (gr. III) in Italy. Afleet Express (TrueNicks A++) is out of a mare by Distant View, and therefore Afleet Express is a product of the Mr. Prospector/Mr. Prospector cross. As regular readers of our writings will know, in general, crossing a stallion back over a mare from his own immediate male line tends to give below opportunity results (although there are obviously exceptions). Afleet Alex’s sire Northern Afleet (TrueNicks,SRO) is a prime example, with only one stakes winner (out of a mare by Quiet American (TrueNicks,SRO), who in turn is by Fappiano, an untypical Mr. Prospector line representative). 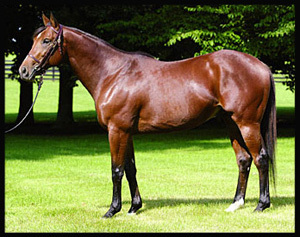 However, Afleet Alex, who supplies Mr. Prospector in the fourth generation of his foals, now has two stakes winners out of 12 starters from Mr. Prospector line mares, and two from six out of mares by sons of Mr. Prospector, suggesting that – on initial evidence at least – he can be considered for mares from this line. In fact, we’d have to consider that Afleet Alex, who doesn’t come from a distinctive male line (for all their merits, neither his sire, Northern Afleet, nor his grandsire, Afleet, have much other representation of note in male line descent) may be a horse who becomes “his own man” as a sire, his characteristics become more distinct from his sire line than is generally the case. The distaff side of his pedigree would seem to open up a number of possibilities: he’s out of a mare by Hawkster (by Silver Hawk), with second and third dams by Hawaii (South African-bred from the Dante branch of Nearco) and Sensitivo (Argentine pedigree). As far as the double of Mr. Prospector goes, the most obvious thing to pick up in Afleet Alex’s pedigree is the strain of Roberto (in his broodmare sire line), Roberto’s dam being a genetic relative to the dam of Mr. Prospector. Afleet Express also has two crosses of Northern Dancer, and one of his genetic relative, Icecapade, both reverse Nearco/Native Dancer crosses to Mr. Prospector. As far as Nearctic – sire of Northern Dancer and Icecapade – is concerned, we can also note that Northern Afleet’s dam, Nuryette, is inbred 3 x 4 to Nearctic, with the second cross through her third dam, Nangela (herself 1 x 3 to Nearctic and his three-parts-sister Sybil’s Sister). We can also note that Northern Afleet and Afleet Express’s dam, Expanse, are both Mr. Prospector/Nearctic crosses, with the Nearctic through three-quarters relatives. Whether by coincidence or not, Icecapade is also prominent in the pedigree of Afleet Again (TrueNicks A++), who is out of a mare by Wild Again (a son of Icecapade). Wild Again has strong genetic ties to Hawaii, sire of the third dam of Afleet Alex (Hawaii is by a grandson of Dante, out of a mare by Mehrali. Wild Again’s granddam, Dama II, is by Dante out of a three-parts-sister to Mehrali). The second dam sire of Jig Time is a three-quarters genetic relative to Raise a Native, sire of Mr. Prospector, so the dams of Afleet Express and Afleet Again are extended reverse crosses. Afleet Alex’s grade I winner and multiple grade I performer Dublin (TrueNick A++), is out of a mare by Storm Bird. This is a branch of Northern Dancer that definitely seems to have an affinity for Afleet Alex as he has two stakes winners and two stakes-placed horses out of Storm Bird line mares, the others being Puerto Rican stakes winner Cuqui’s Love (dam by Storm Cat), and stakes-placed Quick Ride and Scandola, who are out of mares by Tale of the Cat (TrueNicks,SRO) and Forest Wildcat, respectively (both sons of Storm Cat, and one out of a mare by Mr. Prospector, and one out of a mare by Mr. Prospector’s close relative Bold Native). Cuqui’s Love’s granddam, Champion 2-Year-Old Filly Chilukki, is out of a mare by Damascus, which brings us to listed scorer Harissa, who is out of a mare by Time For A Change, a son of Damascus, with a second dam by Northern Jove (Northern Dancer again). The dam, Dynasty, is 5 x 4 to Sun Again (in the male line of Damascus), and this is a strain that has strong ties to Phone Trick (sire of the second dam of Afleet Express) and Storm Cat (who we have discovered seems to like Afleet Alex). Afleet Alex might like Storm Cat/Damascus combinations, or with a similar background, mares by Stormin Fever (TrueNicks,SRO). Afleet Alex’s listed-winning filly Go Ask Alex (TrueNicks B) is out of a mare by Strawberry Road (by Whiskey Road, from the Nijinsky II line, which suggests Royal Academy, a Nijinsky II line horse from the immediate family of Storm Cat). What is really interesting here is the pedigree of the second dam, Madeleine’s Joy, who is by Theatrical (by Nureyev) out of a mare by Mr. Prospector, so a reverse cross to Northern Afleet. Very similarly-bred is Queen Afleet, winner of a Panamanian graded event (black type, but not graded in U.S. catalogs), who is out of a mare by Kingmambo (TrueNicks,SRO) (parallel Mr. Prospector/Nureyev cross to Northern Afleet), with a second dam by Bet Twice, a grandson of Nijinsky II. Obviously, this only a quick snapshot of what Afleet Alex is doing, but with his dam being an outcross for the majority of the U.S. broodmare population, doubling up the Mr. Prospector/Raise a Native/Northern Dancer/Nearctic influence in his sire, certainly seems to be working well, and that can’t hurt his future prospects.